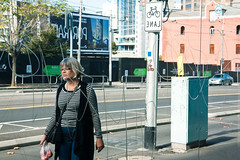 A week ago three people died while they were walking down Swanston Street. One was a French research fellow at Monash. The other two were a young brother and sister on their way to the footy. 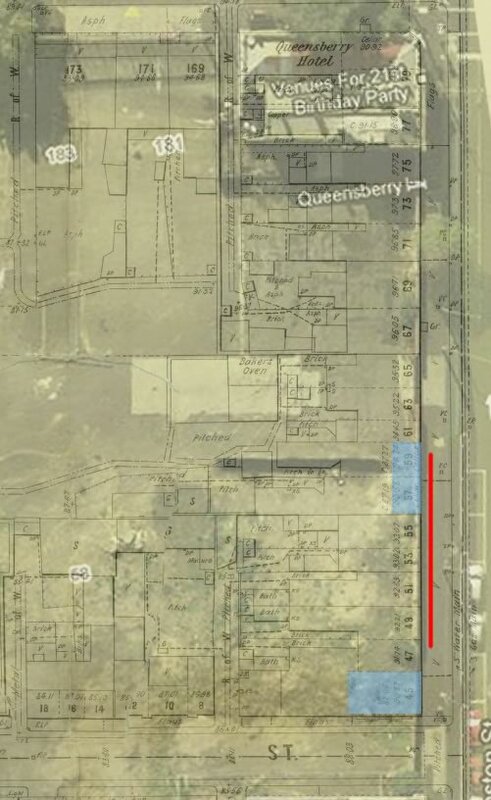 I published a post about the wall that collapsed on Sunday, gathering together what I could find from publicly available web pages. I didn’t expect the level of reaction I got. I was contacted by all sorts of mainstream media outlets, many in search of speculative comment. My investigations were made not because I consider myself an expert in walls and wind, but because I knew how to do it relatively quickly, and because I wanted to do something. This was an accident of the “waiting to happen” variety. No one wanted it to happen, but no one seems to have done anything to prevent it happening either. The organisations involved, the way they interact, and the regulations governing them all, could do with some improvement. But conclusions should be left to the inquiries. We should be watching these inquiries, demanding an independent one, and making sure they have all the information they can get to work with. On Thursday I happened to pass the site again. Once again it had altered. A bulldozer was scraping up the debris while a man hosed the dust down. 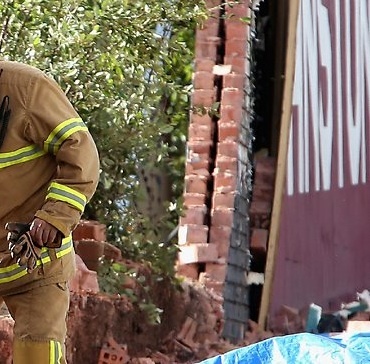 A WorkSafe officer was taking photos of what remained of the footings. A group of random people were gathered at the makeshift shrine, paying their respects . Here are some further observations about the wall – they aren’t conclusions. The previous post is here. Overlay showing ground (2009), contours, approximate wind direction, and approximate positions of the collapse (red line), the mounds on March 28 (green ellipses – about 1.5m high), and the 7.2m high stacked containers. The height of the brick wall was about 2.5 to 2.7m on the street side, depending on where you count bricks. The hoarding extended above the wall by about 250 to 500mm. It varied as the top of the hoarding was sloping while the brick wall stepped down the hill at intervals. 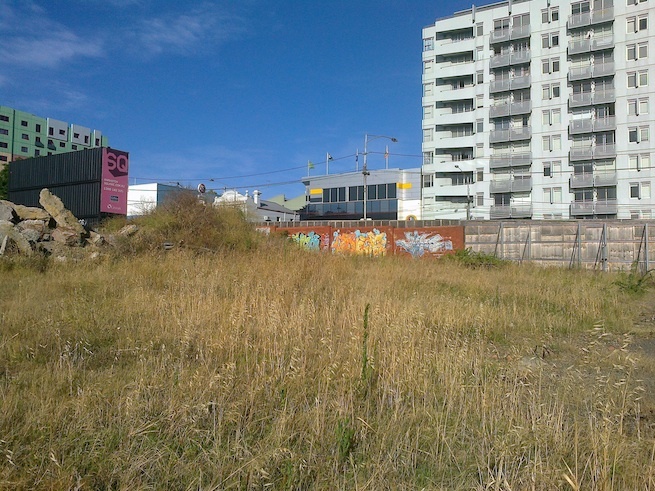 The land drops by about two metres across this 78 metre street frontage. The bricks composing the wall were of two types – extruded “wire-cut” bricks with hollow perforations, and older pressed bricks stamped with “CITY BRICKS”. 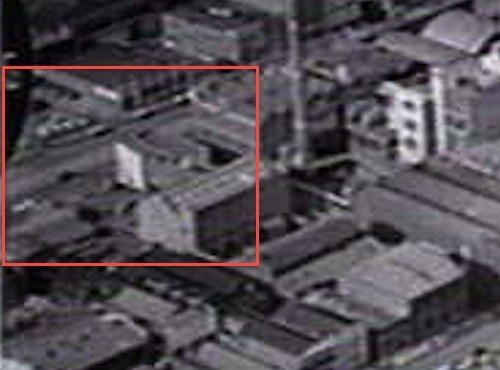 City Bricks, now absorbed into Boral, had been pressing bricks since 1923. This mixing of bricks suggests that the wall could have been built from recycled bricks of varying ages, compressive strengths, and abilities to withstand moisture. The freestanding wall had piers at about four metre intervals along the rear side, which might have been useful buttressing against winds off Swanston Street. [ design guide PDF ] But these piers were not reinforced or tied into a footing, and were much wider (2 bricks) than they were deep (half a brick). It might be more appropriate to call them decorative pilasters, making the wall look more substantial than it actually was. The outer skin of the wall was apparently not bonded to these piers at all. A photo shows how one pier failed in the gust of wind. These ‘piers’ ‘supported’ twin-leaf wall panels with all bricks laid in the same direction. There was no cavity between the two leafs at their base, though there appeared to be a small one further up. This could have allowed the internal faces of the bricks to trap damp lower down. The Southern end of the wall ended at one of these piers. This pier once abutted a rickety timber paling fence. 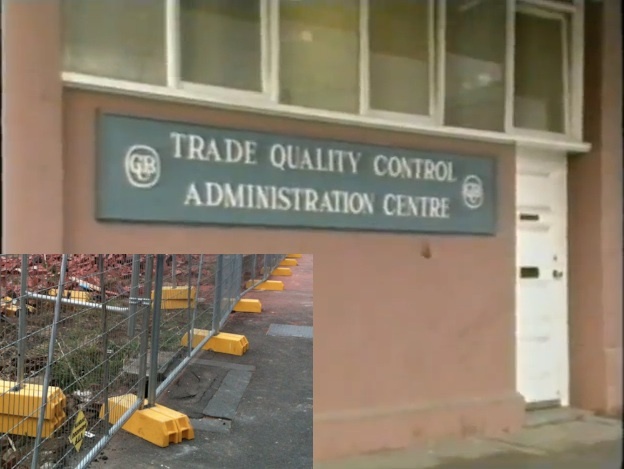 In late 2011 this fence was replaced with a new steel one for the red hoarding. This new fence appears to have butted into the brick wall, and may even have been supported by it as not much else appears to have been holding it up. The hoarding was fixed to both the new fence and the wall, so any wind load placed on the elastic lightweight wall could have transfered to the rigid brick wall through the hoarding. This has been covered in the comments below the first post, and since by media. 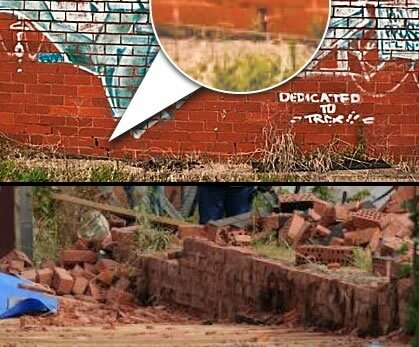 On March 28th, a 9News bulletin panned over a vertical crack visible at the North end of the remaining wall, without comment. 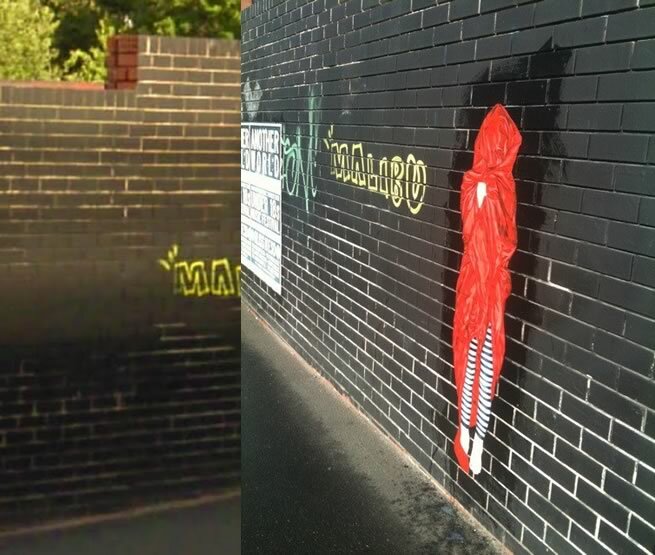 News Ltd has also found photos of diagonal cracking along the rear of the southern portion of wall. 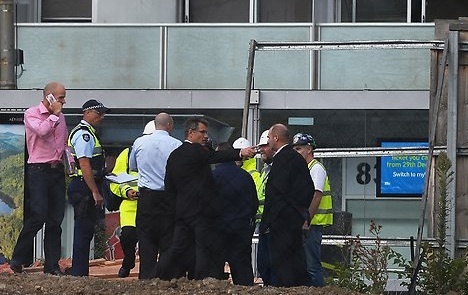 News Ltd found this shocking, but as the wall had no control joints or reinforcement, probable moisture problems, and.. who knows what in the way of footings, it’s hard to be surprised. 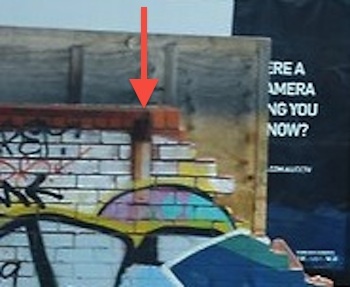 News Ltd’s photos also show black matter at the base of the Southern wall segment. Hopefully this was a damp proof course (which I can’t see anywhere else) and not some kind of mould. From the Swanston Street side, there is also black staining visible on the internal face of the wall which does look more like a mould colony, indicating rising damp. At the Northern end of the collapse, there is a suggestion of what may have prevented the collapse from continuing further. 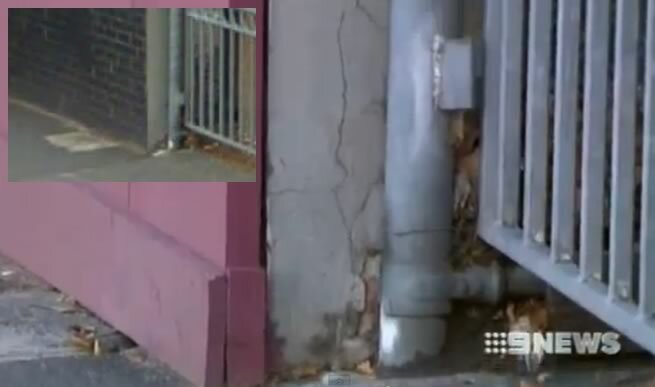 A sliding gate rail is fixed into the wall at the point the collapse stopped. Then again, the fixing may have caused cracking, weakening the wall so that it failed at this point. This part of the wall also seemed to have succumbed more to mortar problems than elsewhere. The front face of the wall showed efflorescence between the paint-sealed bricks, and the local pier, taller than the others, was quite uneven and looks to have eroding mortar. The end capping piece is an extruded brick on end, allowing water to penetrate with ease. Until 2012 the brick wall was partly shielded from Westerlies by a mound of earth and overgown grasslands. This was replaced with a much larger mound in February, after the overburden scrape. By March 28th, all mounds had been shifted and the area was flat. 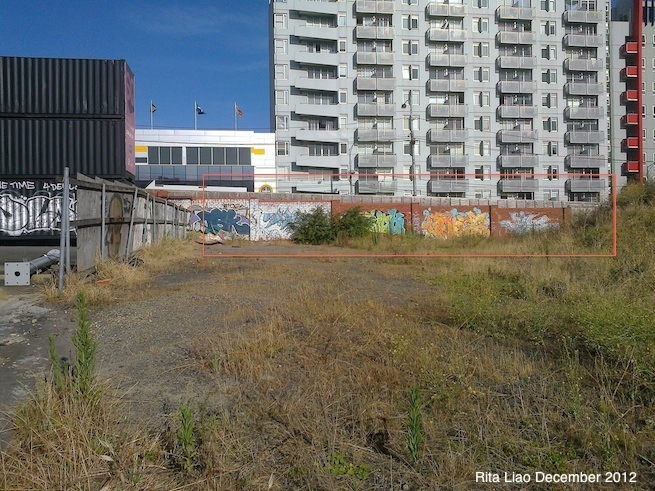 Clear new photos showing the location of this mound last December, and the nature of the land around it, have been sent in by Rita Liao. A photo at Flickr shows the mound in 2011. (AR Wurster ). Another at the Herald Sun shows it there in 2008. 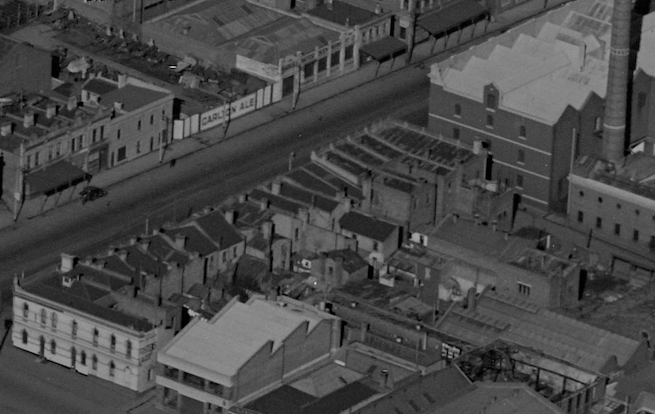 Some time after 1967, a brick wall was built from the Queensberry Hotel right along to the remaining two terraces (557-561 Swanston Street, but shown as 45-47 Madeline St in the plan below). 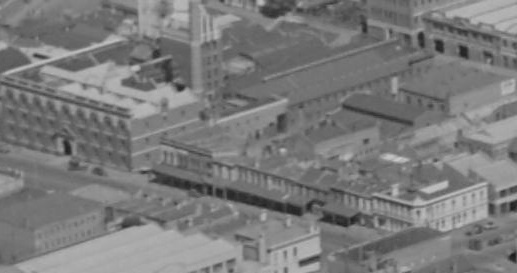 Terrace houses used to stretch the whole way up to the Queensberry Hotel, but had been gradually done away with bu CUB. 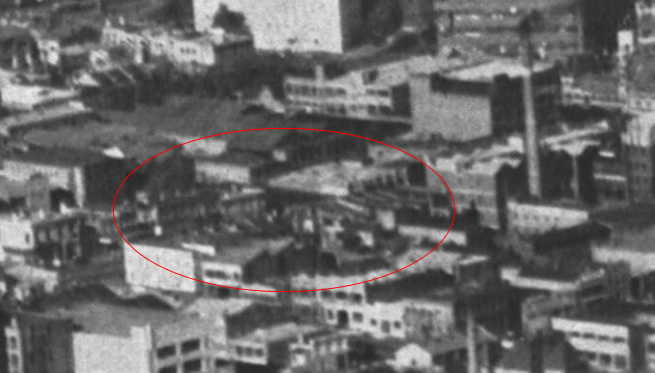 A timber fence later replaced the two last buildings, which were demolished soon after the brewery closed. The removal of these buildings exposed the end of the wall to the elements and removed a boundary wall that may have been acting as a return. 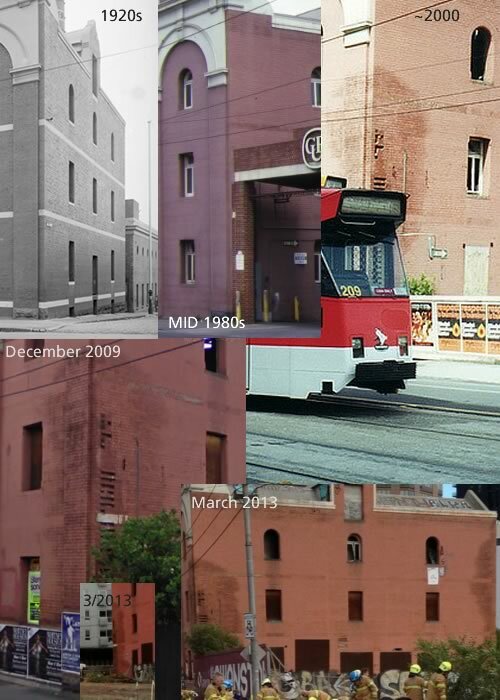 Here are some further images plotting this part of the street through the ages. Here’s a low-res 1968 aerial photo , and another from the year after. 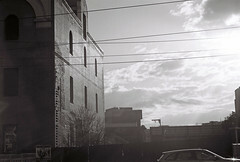 To date, this is the only photo I can find of the wall prior to the demolition of the brewery, taken in 1979 and showing the “top yard” behind the wall and the buildings at the South. This is the blurry online version. ( NLA: Wolfgang Sievers ). 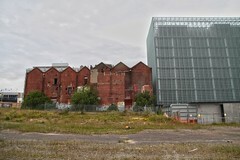 The adjacent malthouse has been in a state of neglect for decades. Built in 1904 and out of use since at least 1987, it too has moisture problems. Moisture is trapped and spreading behind the paintwork added some time before 1988. Demolition of the abutting pier in 1989/90 without any remedial work didn’t help things. I hope that the deteriorating condition of this building is quickly examined in case it too poses a risk to passersby. The first brewery on the site was established in 1858. 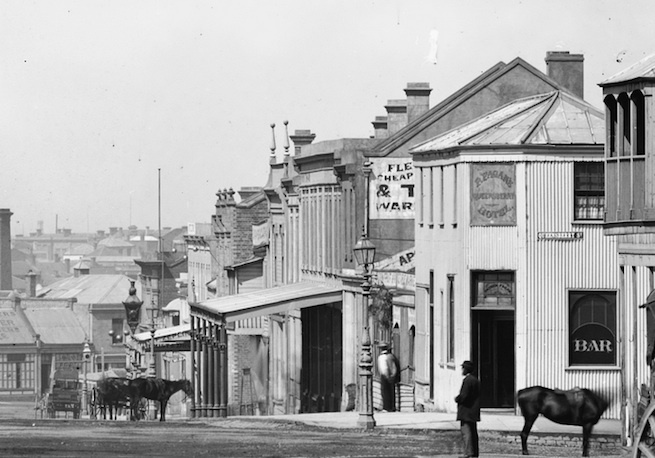 In 1907 a merger of six breweries formed Carlton & United Breweries who then operated from the site. Numerous owners performed building works on the site over its 129 years of production. The brewery was used only for keg production after 1949, and was closed in 1987. 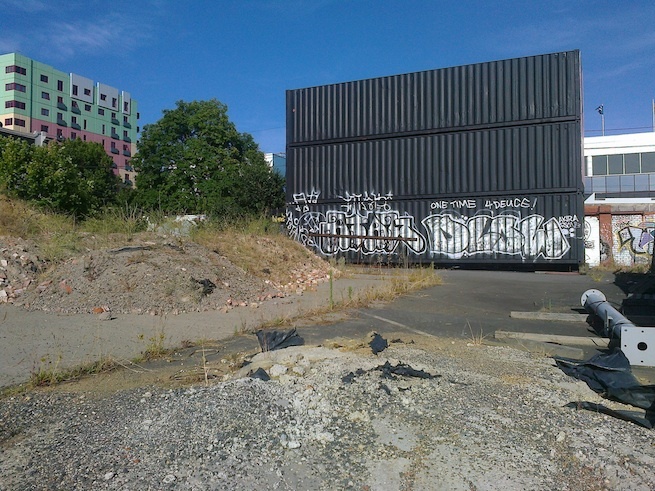 A three part video documents the closure, which makes reference to an outdoor ‘top yard’ used for empty keg deliveries. It had an entry from Swanston Street. From a process of elimination, I’m assuming this to be the yard behind the fallen brick wall. The Australian asserts that there is a “squabble” between the City of Melbourne (CoM) and the Ministry for Planning over who is responsible for the wall. It comes down to a matter of definition – whether the wall is a free-standing hoarding (ministry resposibility), or a street advertisement (council). This wall is both. In its report of 14/03/13, Heritage Victoria list what is included within the site’s heritage registration. 1. 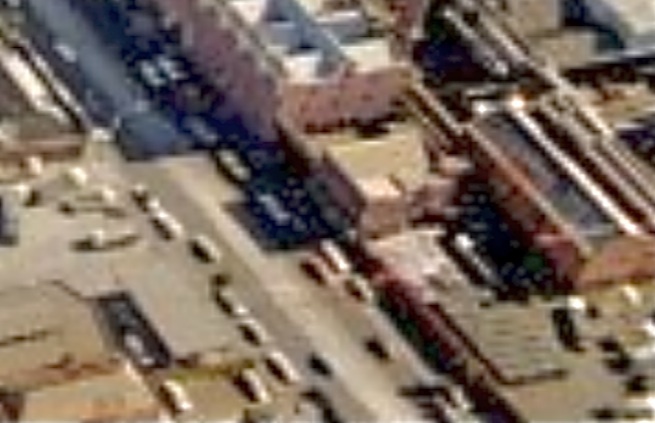 All the buildings known as the former Carlton and United Brewery buildings B1 and former Malthouse B2 marked on Diagram 26 held by the Executive Director. 2. All the land marked L1 on Diagram 26 held by the Executive Director, being part of the land described in Certificate of Title Vol. 7620 Fol. 130 and Vol. 4617 Fol. 290. This section will be updated as any new photographs are found. The photos at the linked Flickr pages can be clicked on to see much larger versions. April: “Portrait” signage and stacked containers in place. Click to view. 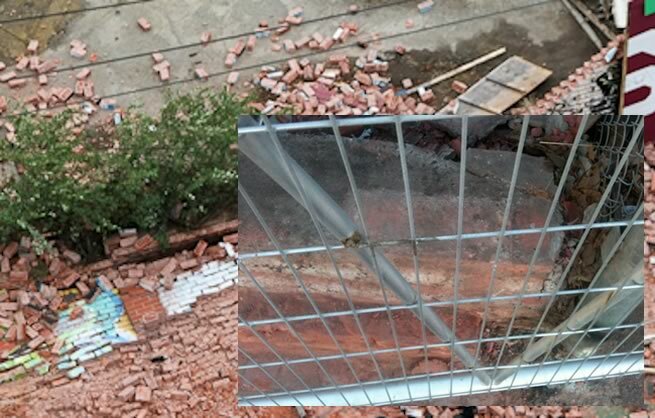 March 28: Wall collapses at about 3pm. Elders buys its shareholder CUB. Council trades plot ratio concessions for community benefits (60 apartments, underground parking, preservation of historic buildings, a podium to the tower). Site control taken by Minister for Planning due to importance to state. Hudson Conway’s Lloyd Williams, site developer, denies that there was ever an agreement with council. RCH considers site for new hospital. January: Masterplanning working group meetings begin, which include representatives from RMIT, City of Melbourne, DPCD, and the State Government architect, and appearances from Heritage Victoria and National Trust. Kmart to be anchor retail tenant of $1.2B development to start in early 2011. EDITS: 10/4/13: add new image links, minor corrections, 12/4/13 lens distortion note, 26/5/23 new images. Hi again Peter. Great work on this. Keep it up. - a cavity? Yikes! Substantially weaker than a solid wall. – mounds and other obstructions can slow the wind but can also accelerate the flow locally – damp can weaken certain types of brick. Particularly if underfired. But.. – a membrane type damp proof course can substantially weaken a wall by providing less friction and less bond than a mortar joint. An over fired, pressed brick can have a very smooth surface, which can also reduce bond. Hi Greg, great to have your struct. engineering input. I’m not sure that was a cavity – may have been the lens – it didn’t look like one in some other pics but all too far away to properly see. I was thinking along the lines of a mortar DPC – what was the norm back in the ’70s? Can the level of firing be gleaned from the darkness of the brick? 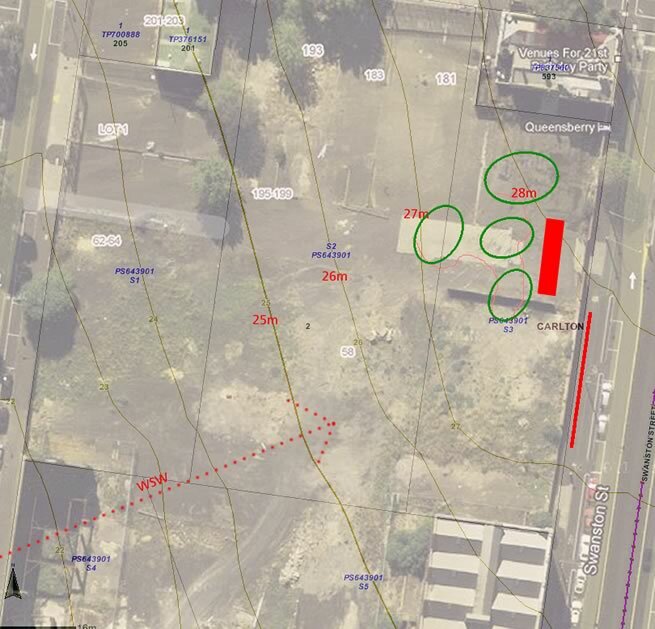 Hi Peter, you might be interested to know that archaeological excavation is being carried out at 557-561 Swanston Street at the moment – apparently digging up the buried footings and back yards of the terrace houses along here. It might be an opportunity to add to your extensive analysis of this site and the tragedy that occurred there.